I’ve taken a packet capture that you can view online here: OSPF Point-to-Point Packet Capture. The capture shows that packets are sent to the 224.0.0.5 AllSPFRouters address. It also shows the DR/BDR ip address as 0.0.0.0, indicating that no DR/BDR election has occurred. The command below shows the default timers on a point-to-point network. In the diagram below you can see that four routers are connected over the same Ethernet segment. You can immediately see the benefit of broadcast networks on this segment when you look at the amount of hello’s sent. If hellos were unicast to each neighbor, each router would have to send 3 hello’s. Because, in broadcast and point-to-point networks, the hellos are sent as multicast packets, it means each router only has to send one hello. I’ve taken a packet capture that you can view online here: OSPF Broadcast Network Packet Capture. You will see within the OPSF Hello Packet that each router sends a hello to 224.0.0.5 & lists the router-id’s it knows about. For example, in the first capture, when the source 10.0.0.3 sends a hello to 224.0.0.5, it lists 1.1.1.1, 2.2.2.2, & 4.4.4.4 as active neighbors. This is actually the verification process that occurs in the 2-way state when the OSPF adjacency is forming. So when routers R1, R2 & R4 receive this multicast, they can see their router-id’s in the hello packet that was sent from R3. The command below shows the default timers in an OSPF broadcast network type. 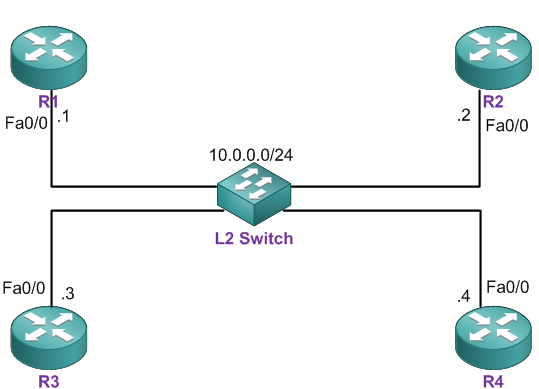 In the diagram below, I’ve configured a point-to-multipoint (broadcast) network. On this type of network, each link is treated as a point-to-point network. So actually, R2 & R3 do not become adjacent. Instead, R1 injects itself as the next hop between these routers in the routing table. The topology is the same as the the previous example, however this is a point-to-multipoint non-broadcast network. This means I had to statically configure the neighbors under the OSPF process on R1, or the hello’s would not be sent. In all non-broadcast networks, the hellos are sent as unicast rather than multicast. The reason for this is because non-broadcast networks do not send either broadcasts or multicasts. Again, each link is treated like a point-to-point network, so R2 & R3 do not become adjacent: and R1, again, injects itself as the next hop between R2 & R3 in the routing table. Please note, the output shows point-to-multipoint. This is just how it displays this network type even though it’s point-t0-multipoint non-broadcast. One last thing on this network type. 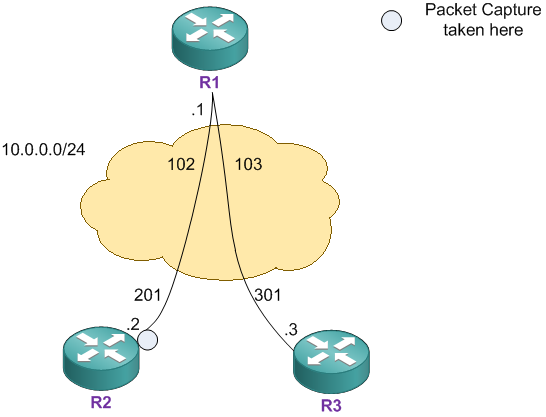 The reason point-t0-multipoint non-broadcast was created was so that the OSPF cost could be assigned on a per neighbor basis, rather than per-interface basis, giving us more control on the way our routing works on multipoint interfaces. I’ve taken a packet capture that you can view online here: OSPF Non-Broadcast Packet Capture. It can be used to verify any of the information above. Very well explained with topology and packet captures. In Non-broadcast Network how router, with router id 10.0.0.1 became the DR, As we know Router with Highest ip address will be DR. So it must be 10.0.0.3. Could you please help me to understand. Order is: highest configured priority, highest router id, highest loopback ip, highest interface ip.